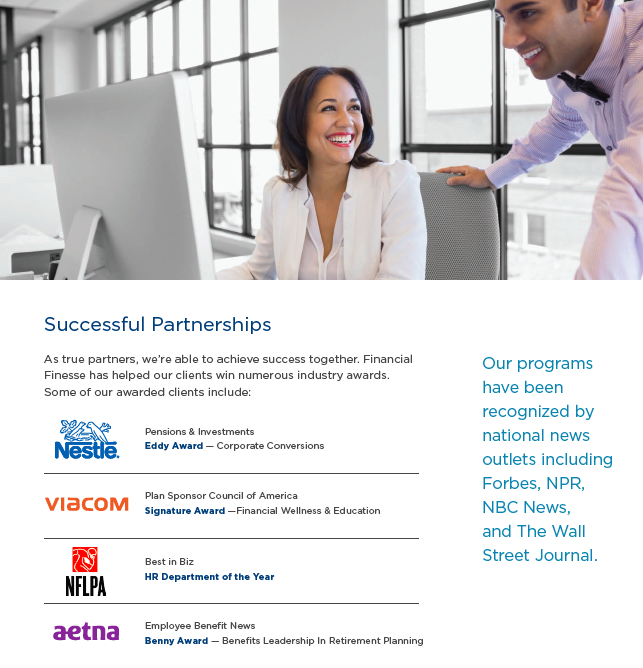 As the nation’s leading provider of unbiased workplace financial wellness programs, we have changed the lives of over 2.4 million employees by partnering with strategic organizations like Nestle, Viacom, Aetna and the NFL PA who understand the value of empowering their employees to take control of their financial future. 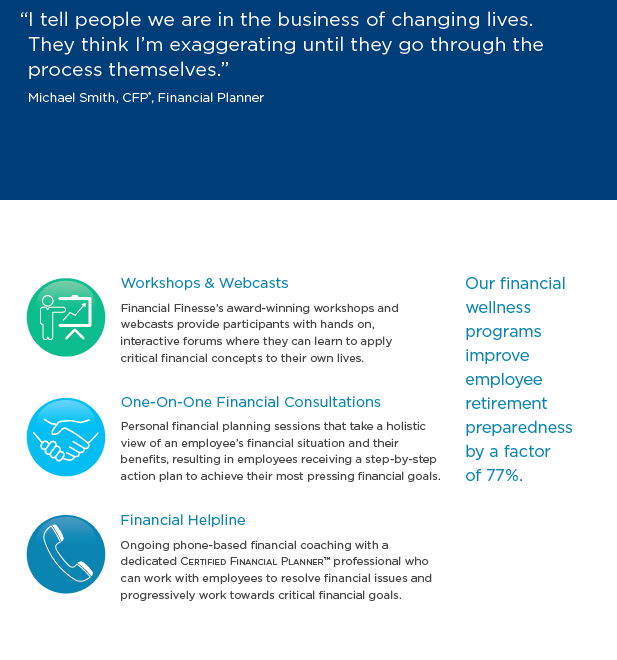 Our proprietary behavioral change model provides employees with unlimited access to personalized financial education and guidance through a variety of different channels, including online, mobile, group education and in-person or telephonic one-on-one financial coaching, all designed and delivered by unbiased, in-house CFP® professionals with 10+ years of experience. Financial Finesse has spent the last 18 years researching and refining our award winning programs to establish best practices that are proven to engage participants, enhance utilization, and provoke the behavior change needed to deliver the ROI our clients seek. Our approach is to strategically partner with our clients to build a customized program designed specifically around their needs. All programs include ongoing consulting around the program design, development and execution of ongoing targeted marketing plans and customized marketing materials, turnkey implementation, integration of all company benefits, and ongoing reporting and analytics around the efficacy of the program. As a best in class benefit for companies striving to recruit and retain top tier talent by enhancing the personal and financial lives of their employees, we deliver innovative solutions to help increase the financial security of all employees and minimize their financial stress. 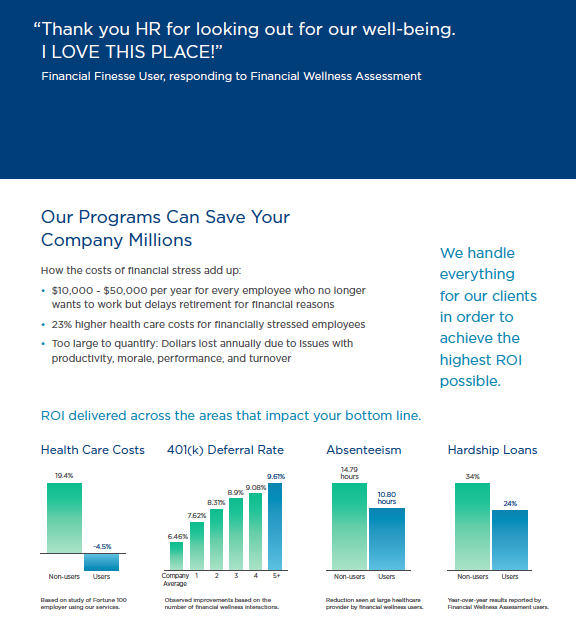 Ultimately, these variables cultivate a more productive and engaged workforce, reduce health care costs and absenteeism, increase deferral rates and retirement preparedness, and collectively promote the overall well-being and ROI of your organization as a whole.